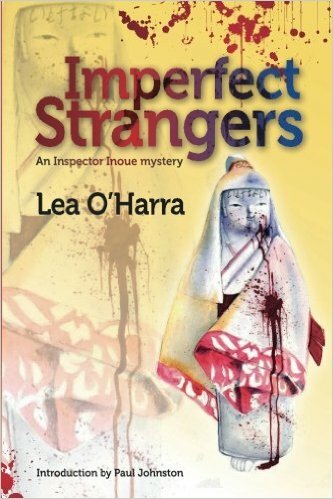 A SWET member writing under the pseudonym Lea O’Harra announces her first novel, Imperfect Strangers, published earlier this year in digital form by Endeavour Press (UK) and in print by Fine Line Press (New Zealand) and available on Amazon. Shikoku-based writer Suzanne Kamata asked the new author a few questions by email on behalf of SWET. Imperfect Strangers is a murder mystery set in small-town, present-day Japan. President Nomura, head of a university in a western prefecture of Japan, is found with his throat slit in his office. Chief Inspector Inoue of the local police learns that the victim had many enemies and few friends. Digging deeper, Inoue uncovers a web of deceit and self-deception, with nearly everyone involved harboring his own secrets and lies. To find Nomura’s killer, the chief inspector realizes he must take into account issues festering in modern-day Japanese society. He faces his greatest challenge, risking professional ruin and personal disgrace, in his race to solve the case. You have a Ph.D. in eighteenth-century English literature. What made you decide to write a murder mystery set in Japan? I got my Ph.D. from Edinburgh University (Scotland) in January 1984 for my thesis on letters written and published by Alexander Pope, the most famous English poet of the early eighteenth century. My research necessitated long periods of time spent in the British Library, then housed in the British Museum. I was closeted up in the North Wing, comparing original manuscripts of Pope’s letters with those he published. It was dry, dull work, although I was excited by the conclusions I reached as I discovered how and why he had changed his own letters for publication. Pope was a consummate artist. His life revolved around writing. I wish I could say it was Pope himself who inspired my own thoughts of becoming a writer, but his example only added impetus to an impulse I had had from my earliest years. I suppose anyone who loves reading will entertain, at some point, the idea of writing. I have always loved reading. I have always wanted to write. The problem was finding something to write about! Following my graduation from Edinburgh and getting a job with a private Japanese university, I began publishing widely: a critical monograph based on my Ph.D. thesis and lots of articles and book reviews and chapters included in scholarly works. Ten years or so ago I also began writing what is called “creative non-fiction”: pieces describing my life as an American long-term resident of Japan—an academic with a tenured position, the wife of a Japanese farmer and the mother of three sons. The actual germ of the story that became the novel Imperfect Strangers is a chapter I wrote in 1998 for a crime fiction competition. I happened to be visiting England that year and chanced upon a notice advertising the competition. I dashed off the chapter, failed to win the competition, and put it away. Then, three years ago, I fished out the fading pages and decided to try to finish a novel based on the idea I had first entertained so many years earlier. Police procedure in Japan is somewhat different from that in other countries. What kind of research did you do? There are some who will think it reprehensible, but I must admit that I did little research on Japanese police procedure. In fact, this issue of how prominent a role it would or should play, along with forensics, in my projected crime novel is a major reason it took me so long to go back to something I had started and begin to expand it into a novel in earnest. Once I’d embarked on my project however, I did consult two people who work for the Japanese police force. One is a fingerprinting expert and the other works with blood analysis. They set me straight on a few matters. Why did you decide on a pseudonym? Advice often given to first-time writers is to “write about what you know.” In Imperfect Strangers, I have done precisely that. But I would prefer the appropriation of details of real life places and actual individuals to remain shrouded in mystery. I have blended fact and fiction in my story. No character in it can precisely be matched to anyone the author really knows, and if someone were to identify with a character in my story, he or she might feel aggrieved as I have attributed traits—often unpleasant ones—to certain characters that they do not necessarily possess. Did you outline the book before you began to write? Did you know “whodunnit” from the beginning, or did that come later? And how long did it take you to write the book? I know that each writer has his own way of proceeding with a work. As I have said, my interest in writing a crime fiction novel was not to present an abstract or ingenious puzzle to be solved but, rather, to depict various personalities who might act or react in certain ways given certain circumstances. As I wrote, at key points in the story it seemed the characters I had devised had come to possess a life of their own and were telling me what should come next. The identity of the murderer, for example, was only gradually revealed to me and, in fact, it came as something of a surprise. Your “day job” is quite different from that of a professional writer. How have you found this other way to explore your talents and aspirations through writing? The “day job” was nothing I had ever planned for. I had embarked on a doctorate at Edinburgh and was delighted when I was granted a full scholarship. I had no career path planned. Upon completing my thesis, a post at a small Japanese university came my way. The pay was good, the conditions satisfactory, and it seemed the best option at the time. I had no idea if I could teach or even wanted to. When I first arrived in Japan, I was terrified at the prospect of having to appear in front of a class at a Japanese college. I had been hired simply on the strength of my Ph.D. I had no teaching experience and had never taken a linguistics or education class in my life. But the students were friendly and obedient and the other teachers helpful so I soon became accustomed to my work. My home life was another matter. I felt lonely. There was only one other foreigner in my small town, and hardly any of my colleagues spoke English with any fluency. This was the early 1980s, when there were far fewer ex-pats in Japan than there are now and I was isolated. Although I had quickly mastered the duties attached to teaching English, I was seized by the worry that I would stagnate in my new circumstances, that I would no longer be able to do research, that I would be stranded without intellectual stimulation. That fear also soon dissipated. I met some fellow foreigners in a neighboring city and I found I was able, after all, to continue my research and to publish reviews and articles. Eventually I began trying to compose “creative non-fiction.” I needed to write. I had to write! I have always found writing a type of release, often of the cathartic variety. As a long-term ex-pat resident of Japan, I am fascinated by the question whether fellow writers like me who live for extended periods in other countries find this sort of voluntary exile a help or a hindrance in their writing. There is also the fact that living in Japan poses special challenges. We Westerners simply cannot pass as natives. Our physical appearance makes us immediately recognizable and sets us apart. And there are other considerable obstacles Japan poses for its ex-pat writers’ community. It may take the average resident from overseas several years and considerable effort to master Japanese—that is, the ability to read and write the language at a reasonable level as well as to hold conversations in it of any complexity. It may take even longer, perhaps, for some, a lifetime to be able to understand the intricate code of Japanese behavior and belief. Social attitudes and customs are so entrenched! Yet I ended up staying and marrying. My husband is Japanese and our children consider themselves so, and through them as well as my work, I have gradually gained a sort of insight into the prevailing mentality. Since my mastery in reading Japanese is not that strong, I need to approach writing about Japan as an outsider looking in. That perspective of the dispassionate observer informed my creative non-fiction pieces, but I began to tire of writing about my own experiences. I wanted to exercise my imagination, to venture into writing about something new. Hence my crime fiction novel with its two male protagonists: Chief Inspector Kenji Inoue of a small rural police force and Andrew Thomas, a vulnerable, unhappy young Canadian teaching at a private Japanese university. Murder, intrigue, suspicion: how fun to try to portray all these things. What a challenge, in several of the novel’s Japanese characters, to try to get into the head of a Japanese and to portray the world as they might see and experience it. Did you have any difficulty finding a publisher for your book? Did you get editing and proofreading help with the process? How much interest is there, from your experience, for this kind of crime fiction written in English, but based in a foreign country? The tale of how I finally got my book published is long and convoluted. As I mentioned above, I had cherished from childhood the longing to write and publish a novel. The chapter I had dashed off for the 1998 crime writers’ competition failed to get even a passing mention, so I put it aside. As time went on, I grew frustrated that I had not yet written a book. I felt worried, even terrified, that I might never realize that dream. Then I chanced, one day, upon that piece and decided to try to flesh it out into a novel-length story. It took about nine months. It was about 100,000 words when I sent it to a literary agency in Britain for an appraisal. I got some encouragement but, more important, some valuable advice in how to rewrite it for publication. I plunged into the project and did a complete revision, sending it back to the same literary agency about four months later. This time, I was told the manuscript was ready to be submitted for publication. I sent off perhaps twenty letters to potential literary agents and twenty to publishers. I got no replies from the publishers but four agents wrote to say that they would be willing to represent me. I chose the agent who had written back at the greatest length about the book, who had obviously read it carefully and made lots of useful suggestions. She sent it off to about thirty well-known publishers but with no luck, although many wrote nice comments about my story. At this point, I was quite at a loss. Several months earlier, I had attended a crime fiction conference in Gdansk, so I wrote to one of the authors I had made friends with. She suggested that I contact a woman who works as an agent at the forefront of the new e-book wave in the United States, and this person in turn advised I send my story to a friend of hers, an editor with an excellent track record in helping fledgling authors. This editor, based in the United States, pinpointed the weaknesses of my story with what I subsequently realized was unwavering accuracy. I revised the manuscript once more, and then it quickly was accepted by the UK e-book publisher, Endeavour Press. But I also wanted a print version, something I could hold in my hands and cherish, and at this point I contacted an old friend, Graham Bathgate, of Fine Line Press in New Zealand, and he agreed to help edit and design a book for me. It was a long process! But, of course, it was worth it in the end. Can you tell us a little about your next book? My next book is called Progeny. It resembles Imperfect Strangers in featuring Kenji Inoue, chief inspector of a small-town Japanese police force (an imaginary community called Fujikawa), who needs to solve a crime with the aid of two younger officers: Kubo and Ando. It also resembles Imperfect Strangers in representing a dissection of modern Japan as well as a murder mystery. Imperfect Strangers touches upon such topics as the growing popularity of international marriage in what has traditionally been a homogeneous society, the Korean fingerprinting issue, gender discrimination in the workplace and at home, tensions between the general populace and far right, supposedly patriotic elements, and Japan’s demographic crisis precipitated by an aging population and a shrinking birthrate. In Progeny the issues touched upon are the hikikomori problem dating from the early 1990s, resulting in what some have described as a ‘lost generation’ of young Japanese, domestic violence, school bullying, bōsōzoku gangs, and the breakdown of traditional family and societal roles. Progeny, like Imperfect Strangers, also examines challenges raised by international marriages in Japan, including problems that may be faced by biracial children or hafu (half Japanese). The action of Progeny arises from a real-life incident: the murder of a small child in a shopping mall and the disposal of the child’s body in a sports bag thrown into a nearby river. This initial act of violence has many repercussions just as, when an object is thrown into water, the initial splash is accompanied by an ever-widening circle of ripples. I hope to finish this sequel to Imperfect Strangers within the next few months. Suzanne Kamata is the author of the novels Losing Kei (translated into Russian), Gadget Girl: The Art of Being Invisible (APALA YA Honor Book), and Screaming Divas (named to the American Library Association Rainbow List). She is a recipient of a Sustainable Arts Foundation grant and currently teaches at Tokushima University.